What would be the use in Linux if it didn’t have great software? I’d rather put up with a poorer Operating System than have no software, wouldn’t you? What if I don’t want to use another app? – I like most of my Windows/mac software just fine! First things first – ‘Codec’ licensing, or, ‘Why the heck can’t I play some audio files or movies’? First things first, it is understandable that some users may not wish to move from what they know best. Even although many of the titles (even at zero cost) compete directly, or even exceed the quality of their big commercial counterparts. You may find solace in knowing that it is possible to run Microsoft Office as well as a great many other Windows apps on Linux! – Although it is not software written for Linux, it is possible to run it using software from a firm called CodeWeavers. The software, called Crossover supports Microsoft Office, as well as many other popular Windows titles such as Adobe Photoshop, Microsoft Visio, Lotus Notes, Apple iTunes and so on. It retails for a modest fee. There’s also free options that allow you to run Windows software in Linux such as Wine with WineTricks and Play On Linux. Don’t forget that these days, Linux ships with many native apps that are cross-platform, meaning they run on Windows, Mac and Linux. And now with Ubuntu’s snap and Fedora’s Flatpak systems, they even run ‘containers’ that allow you to run software like Skype, Spotify and Kodi amongst thousands of others. Ubuntu’s Snapcraft store lets you install software which isn’t natively made for Linux, such as the Spotify app. Despite of all the abilities to run software that wasn’t built for Linux, it’s reasonably easy to get your favourite titles brought over to Linux if you really must keep them. However, not investing a little time in evaluating just some of the amazing native Linux software titles out there would be a travesty indeed, so the rest of this page is dedicated to showing you how great Linux software is. Most of it free! When Linux first came out back in the early 1990s one of the downfalls of Linux was that good office software was lacking, making it an impractical system for business users. From the late nineties onwards, this is no longer the case. LibreOffice: Microsoft Office users will be pleased to know that the most popular Office suite in Linux, LibreOffice, supports Microsoft Word Documents, Excel Spreadsheets and PowerPoint presentations. The latest incarnation of LibreOffice includes a Word Processor (with export to PDF feature), Spreadsheet, Presentation creator and more. OpenOffice: LibreOffice was originally built on software made by Sun (now owned by Oracle), which is a ‘fork’ of the still available OpenOffice. The Apache project currently maintain that. It looks and works in a similar way to LibreOffice. KDE users can use the many apps in the Calligra office suite including Words, Sheets, Stage (presentation sofware), Plan: A project management application that can create Gantt charts. Braindump: A notetaking and mindmapping application. Flow: A programmable flowchart drawing program. Karbon: A vector graphics editor. Krita: A digital painting program with some image editing features. Author i An e-book authoring application like iBooks Author. Finally Kexi (A visual database management front-end, similar to Microsoft Access, with limited compatibility to Access’ file format. A Report Designer is included). Google’s G Suite – Obviously Google’s cloud service is available in your web browser so you can work and share with Docs, Sheets and Slides. OnlyOffice is a completely completely cloud based service (like Office365.com) and is guaranteed 100% Microsoft Office compatible. The GNOME project also authors a bunch of office tools such as: Ease (Presentations), AbiWord (Word processor), Gnumeric (SpreadSheet), Inkscape (Drawing) and GnuCash (Financial Management) as well as more. WPS Office: WPS is made by a commercial company and has a free edition for Personal and Education use. The Business version costs around $45/yr. It looks really slick and operates very similarly to MS Office. Evolution showing its Mail view (left) and Kontact showing it’s calendar view (right). Both bear striking similarities to Microsoft Outlook. 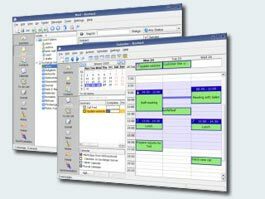 Evolution is provided with a standard GNOME desktop environment and is a groupware suite for performing all of your day to day E-Mail, Scheduling, Contact Management, Address Books and more. Users can retrieve their E-Mail from a vast array of sources including IMAP, POP3, Gmail, Microsoft Exchange and Novell GroupWise Servers amongst others. It’s overall look and feel is similar to that of Microsoft Outlook. It also supports some mobile devices and LDAP directory servers for great connectivity, wherever you are. KDE’s personal information manager management software is a fantastic groupware suite for Linux. Kontact features a summary overview, a very capable E-Mail client, contact manager, to do list, journal, news reader, note taker, RSS/Syndication client and a mobile device synchronisation tool. Support for Novell GroupWare and Microsoft Exchange are not as mature as with Evolution, but are pretty much there in terms of usability. Thunderbird is made by the same people that brought us FireFox and is as sharp as it’s browser counterpart. It offers E-Mail with built in Junkmail filters, IMAP and POP mail server support, contact manager and address book. It is lightweight and easy to use. You can also download its calendar companion, Lightning, it works, but it’s not nearly as full featured as Kontact or Evolution. Mozilla Lightning (Thunderbird’s calendar plugin). Artwork has often been the lair of Mac users. This is mainly for historic reasons these days – (Apple used to have an exclusive contract with Adobe). However, times have changed, and Windows users enjoy many of the same fruits as the Mac users do. It’s also fair to say that this software is often expensive, however some excellent software exists for Linux for vector and bitmap artists alike and most of it is free. The GNU Image Manipulation Project (GIMP) is the classic Photoshop-like image editor for Linux. It’s been around for a long time and can do most of the features of all the popular off-the-shelf competitors. In case you were wondering, GIMP stands for GNU Image Manipulation Project. GIMP was made with tasks like photo retouching, image composition and authoring in mind, and it should be fairly easy for an accomplished Photoshop user to convert to the GIMP. If you can’t live without Photoshop, it is possible to use Photoshop in Linux, using Crossover. Inkscape is a vector graphics editor, similar to Adobe Illustrator, Freehand, CorelDraw, or Xara X using the Scalable Vector Graphics format. Features include shapes, paths, text, markers, clones, alpha blending, transforms, gradients, patterns, and grouping. Inkscape also supports Creative Commons meta-data, node editing, layers, complex path operations, bitmap tracing, text-on-path, flowed text, direct XML editing, and more. It imports formats such as JPEG, PNG, TIFF, and others and exports PNG as well as multiple vector-based formats. Don’t forget that OpenOffice.org also has a component called Draw, which has a reasonably good vector graphics editor. Also Kivio (part of KOffice), and Dia are great alternatives to Microsoft Visio. Linux has many applications for playing music and it’s also really taken off as a platform for audiophiles. If you are a budding DJ, or play with MIDI instruments, Linux is a great operating system to use. There is a wealth of software available today which exceeds the requirements of many a Cubase user, and all for free! If you have just started using Ubuntu, you may notice that if you try to play some types of music or video files, you will find that can’t do it! There is a good reason for this – Ubuntu, (as with Fedora, Suse Open Edition and any other completely free Linux distribution) cannot ship with software that is either not free, or contains a license which is considered commercial. It may not be illegal to distribute such software without a charge, but you may be required to accept a seperate license from the authors of that software, or use the software on different terms than the rest of the system. In order to keep your distribution of Linux truly free, and the legalities of licensing a non-issue, this software is distributed separately from Ubuntu (as with other distributions). If you need a refresher on installing software, refer to this guide for detailed instructions on installing software for your particular distribution. See the official Ubuntu documentation for more info on restricted formats. As usual, both KDE and GNOME desktops have excellent offerings, and whilst there is a wealth of audio player software available for both platforms, I will limit the following reviews to just two players, one from each desktop platform: Rhythmbox (GNOME), and AmaroK (KDE). Rythmbox and it’s little sister, GNOME Music is one of the many audio apps available for Linux both built with the GNOME aesthetic in mind. Both are fairly similar in interface to iTunes, it allows you to listen and organise all your music on your PC. Rythmbox is a little more feature-rich and allows connecting your digital music player to upload/download music to. It also connects you to Internet radio stations, Podcasts. It has in-built support for playing, ripping and burning audio CDs. Despite having a silly name, amaroK is a great music player for KDE users (it can also be installed on any other desktop). Fans of iTunes will be immediately relieved to hear that it looks very like iTunes and syncs with your iPod/iPhone flawlessly. It creates dynamic playlists too, like the party shuffle feature in iTunes, but better! amaroK features automatic CD cover finders for each album on your PC, so you know what the CD looks like when you play it. It also grabs the lyrics for every song you play on demand, as well as telling you pretty much all the info you would ever want to know about the band you are listening to, from Wikipedia. It also features a built in ID3 tag editor to sort out those rogue MP3s with invalid entries, and features MusicBrainz to take some of the guesswork out of it. Again, there are so many good tools out there for sound editing, it is hard to name but a few here, but we will try to keep it to a good few! Give Audacity a spin, for example, if you want a great multi-track audio editor. Ardour is a professional digital audio workstation application. For the budding drummers, there’s Hydrogen, the drum machine software. Guitarix, the Virtual Guitar App and RoseGarden which is a powerful audio, MIDI and score editing and sequencing environment for musicians. Ardour is a digital audio workstation which can be used to record, edit and mix multi-track audio. It even goes as far as mixing video soundtracks. Ardour is similar to ProTools in it’s ultimate quest, and uses the much acclaimed JACK audio system. It allows the use of plugins such as AudioUnit, LV2, LinuxVST and LADSPA formats. FX plugins. Software instruments. MIDI processors. Ardour has an excellent manual, and a quick and easy to use GUI. Ardour appears to be quick, snappy and doesn’t use up too much CPU time, making it an excellent choice for a sound buff! Audacity is well worth a mention because whilst it does not have all of the features and power of Ardour, it does fill all of the needs of a sound-editing novice, whilst still beating any entry level sound editing software on the shelves. Audacity’s standard features can be picked up in a matter of minutes and allows for some really professional results. It offers unlimited tracks and many different effects in-built, so if all you need is straightforward multitrack or single-track editing, Audacity is a great tool. It is my go to. Rosegarden is an easy-to-learn, attractive application and ideal for composers, musicians, music students, small studio or home recording environments. Sound on Sound magazine called Rosegarden the closest native equivalent to Cubase for Linux, which is no mean feat, and Rosegarden has come to the acclaim of many other publications such as Linux Format’s Top Stuff awards. VLC is an incredibly well known media viewer known for its versatility. VLC is a Multiplatform media player (Works on Linux, Windows and Mac). VLC is now regarded as the king of all media players on all of the platforms and is a great app, if a little difficult to navigate, however it offers a wonderful array of playback possibilities – handling almost every format out there, it’s very versatile, but it’s real power comes from the fact that you can serve up media from any pc and get it to appear anywhere else – beam videos over the net, or just to another monitor in another room in your house. Support for resampling makes bandwidth problems with Internet broadcasting less of a problem. MPV is a video player that has a sleek minimalist GUI and plenty of features. You can even use it in the command line. If you are not happy with VLC, you should give MPV a try. (It’s also an online video content player, a Hulu or Netflix of Linux, if you will)/Miro allows you to convert any video formats you like as well as download and play almost any video. It will work with your current music library and will synchronise content to android and kindle formats. It will download Bittorrents and you can also buy music and apps inside Miro. Kodi – a full-fledged media center. It can handle videos, music, pictures, podcasts and even games. You can even record TV with it. Banshee (an all-round media player for GNOME, similar to iTunes). Believe it or not, some professional movie studios have actually made the leap to Linux, which is a huge sign of just how good some of the software is out there. I’m not a professional video editor as you can probably tell from a number of the videos on this site (!) but you can see that even someone inexperienced like me can pick up the tools and get pretty good output without much work. If you’ve ever used a Mac before, you may have had a play with iMovie. It’s a great tool. It’s the every-person’s video editing app. Kdenlive is the Linux equivalent and if you want a straight forward movie editor, this is your best bet. If you want something more fuller featured, this might not have everything you want. Supporting HD video, Blu-Ray and 3D, it’s got a lot of features you might not expect from a simple to use video editor. If you are a fan of software like iMovie for the Mac, you’ll feel at home with OpenShot. Straight forward movie editor, with support for hundreds of audio and video formats. It’s got lots of device and transport options as well as a nice looking interface. If you need more than the others above, then Cinerella is for you. Hue, Saturation, Denoising, Compression, Time Stretching, Text-to-movie, batch rendering and much more are all staples of this sophisticated video editing suite. It’s been around since 1998, so this surely means it’s the grandfather of all the other video editing tools out there for Linux! Although Blender is not technically a movie editor it’s worthy of a mention. A number of movies have been created with this sophisticated 3D graphics and animation creator, it’s been around a long time and is still in active development. Blender is what the pro’s use in animation studios around the world. It can also do movie editing. With Linux, you can literally turn an old PC into a Linux style Sky Plus/Tivo box, all you need is a TV card and a big enough hard drive to record all your binge watching of Game of Thrones! MythTV allows you to turn your PC into a Media Centre complete with PVR and TV options. MythTV is open source software that turns your PC into a PVR (Personal Video Recorder). It enables the user to pause live TV, Skip ads, use an electronic program guide, set recordings to record whole series of a particular program, edit recording schedules, organise and view your home photo and videocamera collections as well as listening to music and record content from the Internet, it excels at many points, making it a cut above the current offerings from Microsoft (Media Centre) and PowerCinema. Also check out MythBuntu,which is an Ubuntu based pre-packaged distribution of MythTV, making it easy to install on a PC. If you only want to do the basics, you can record and watch live TV then you don’t need to use something as feature-laden as MythTV. Popular titles for viewing and recording TV are tvtime and xawtv. The Hauppage series of TV cards seems to work best with the Linux TV software as it is the most popular range, and best supported through the video4linux driver. In the past, games a had been a mixed bag with Linux. The games landscape has come a long way in recent years, however it still needs perfecting. Large name companies are releasing their top titles for Linux as well as Windows these days, helping the overall popularity of Linux as a gaming platform no end. Steam is a popular Windows (and laterally Macintosh) games platform. Steam hosts thousands of blockbuster titles, and is now available for Linux. Not all of the titles are available for Linux yet, but this seems to be a work in progress. Many new games are being released ‘natively’ for Linux (that is, the software is written to work in Linux). Other games which will also work with Linux because they have been ported from their Windows base. Popular Linux games that you can play for free at the time of writing (January 2019) include Team Fortress 2, DOTA 2, War Thunder, Star Conflict, Robocraft, the zombie shooter No More Room in Hell and the new release of Super Tux Cart (yes, its Super Mario Cart, but with your favourite Linux mascot!). These are just some examples. However, the number of natively available Linux games is still relatively low compared to Windows, there is a solution to offer some ability to play Windows only games – Crossover is a program which allows the user to play most of the Windows games titles within Linux. This software is not free, but is fairly priced ($48 USD/yr), and offers a good degree of ease of use and includes support. Portable Linux Games – Games that have been ported to Linux. These are just some examples of the hundreds of thousands of great Linux apps out there. With all this awesome software out there, you’ll start to wonder why you ever bothered with Windows or macOS at all! Now that you’ve finished the seven chapters of the main introduction to Linux, why not check out some other areas of the guide once you feel comfortable with your new operating system! Very enlightening. Helps a new linux user to know that there are few real limits to what you can do with a non windows operating system. Goodbye Microsoft.